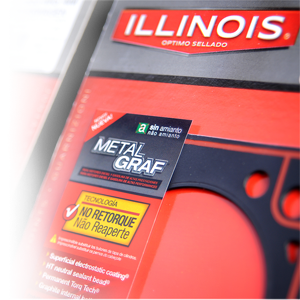 With the MetalGraf® line, we get the balance between the Standard Gasket (fiber) and the Multilayer Gasket (MLS), assuring the perfect fitting of pieces thanks to its exclusive design. INTERNAL INSULATION. High Compression with graphite coating. EXCELLENT THERMIC ENDURANCE. It endures the highest pressures and temperatures. BETTER ADJUSTMENT to irregularities in heads and/or blocks. GREATEST ENDURANCE to chemical aggression of antifreezes and synthetic oils. BETTER RESPONSE to engine contraction and expansion.